Simple Idea, Big Community Impact - The Goal was MET! What do you get when you have 250 donors, committed volunteers, a board of directors that always steps up, an amazing staff and organizations like UGI that allow us to transform an auditorium for 10 days? You get the satisfaction of knowing that 35 nonprofits here in our community who work every day of the year to help the youth in our community share "happiness in a shoe box" for over 7,500 children. We are so overwhelmed and joyous to be able to share that the goal of 7,733 shoe boxes was met. Donors came carrying anywhere from 1 box to 558 boxes. Cash donations were received and the staff and volunteers shopped to ensure every box could be filled. Every single box makes a difference. A special shout out to the Northampton Bar Association, LG Photography, Enterprise, Josh Early Candies, St. Thomas More, RCN, Art of Dance and all of our amazing donors. Vehicles of all sizes rolled in to the pick up zone and every shoe box was packed in to vans, trucks and even a Cooper since Monday morning. The vehicles were loaded beyond capacity and now each of the nonprofits will celebrate the holidays with parties and events. We are so blessed to have the great fortune to run this program each year and it continues to grow. 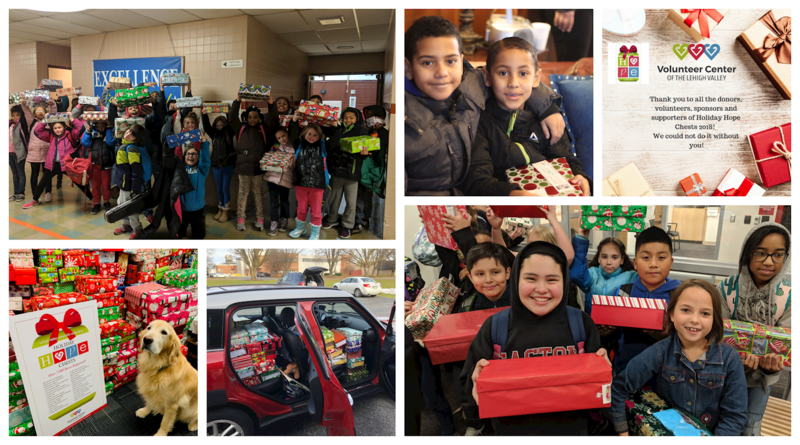 Thank you for helping us provide HAPPINESS IN A SHOE BOX through our 2018 Holiday Hope Chestsprogram! See the list of nonprofits who received shoeboxes this year. Follow The Box from ASR Media Productions on Vimeo. If you would like to sponsor boxes for next year, please fill out our financial support form. For more information about this program, please contact the Volunteer Center at 610-807-0336.